9:20 PM: And here’s Penelope Cruz and our host, Ellen DeGeneres. Let’s see, we have Best Costumes for The Great Gatsby, Cate Blanchett for Best Actress, Matthew McConaughey for Best Actor and 12 Years A Slave for Best Picture. That means no one got all four, but muddgirl and dannyscotland each got three. 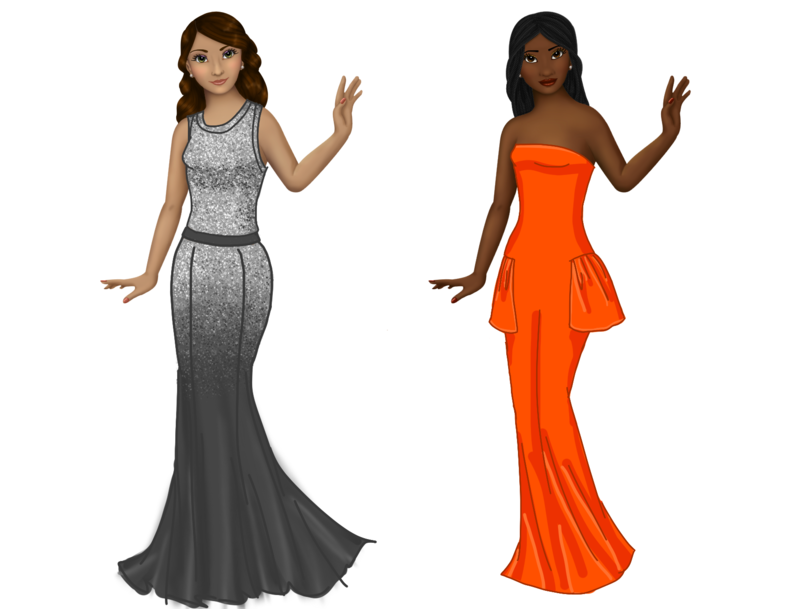 So you both win a recolored dress from the new series! Since I’ve just started out and there’s really only three choices (well, five if you count the dresses Mia and Leyla are wearing, but I wouldn’t) you’re free to wait for a better selection, or let me know if you’d like one right away – either way works for me! As for which of these drawings will become an actual dress, let’s put up a poll. It’s at the end of this post. I’ve had lots of fun with this round of Oscars dresses! I hope to do it again next year, but next time I’ll make the post earlier so more people can enter. 5:58: Taking the next hour off to put together dinner and get the boy in bed. I’ll pick out new outfits and start sketching again at 7. 5:45: Here’s Emma Watson and Jennifer Lawrence. I think the coloring on Jennifer’s is great, particularly! I’m up for taking suggestions, so if you see a dress you really like post in the comments. 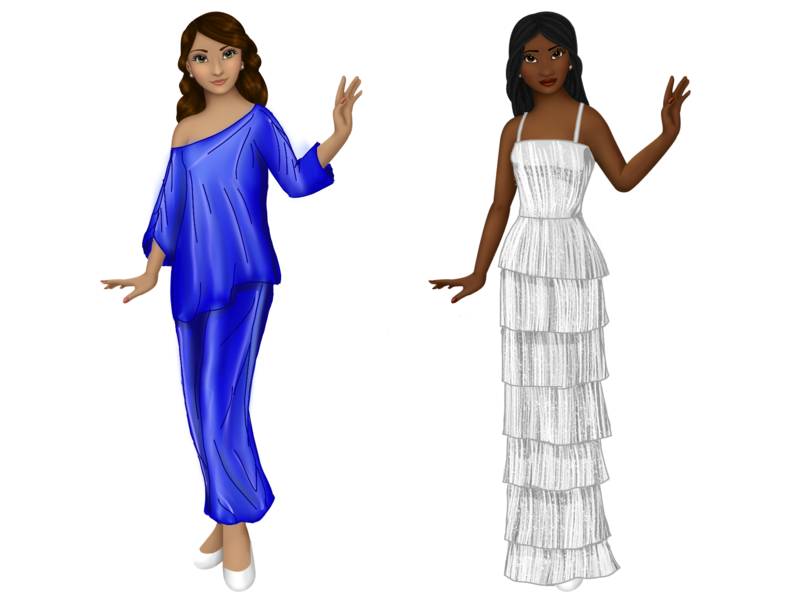 Caveats – the dress has to work on more than one skin color. For example, I may do Julia Roberts’ dress and just change the little lace panel in the middle, but Lady Gaga’s, with the net base, is probably out. The actual Oscars is going by now, right? 4:00 (all times PST): Hello! I think the last times I did this I had more readers, so I don’t know if I’ll be all alone or not. If I have company, please say hi in the comments and enter my contest! Hi Liana, good luck with your contest. I haven’t seen any of the movies, so I’m not really qualified to vote. Your dresses are beautiful. Have fun! Feel free to enter anyways, Lisa! :) It’s what you think will win, not what you think should win, right? I think you should do Liza Minelli’s outfit! I love the color and the texture! Gorgeous dresses!! Lisa would guess, but she was snoring right after Ellen!! Phew, I just got that in by a hair!! Hah :) Yep, no more entries now! It’s either pale colors or black-and-white this year! I myself like Jennifer Garner’s dress (maybe because I like Jennifer Garner) and the dress worn by Christine Teigen (who I don’t recognize…probably because I don’t watch enough movies!). Adele Fassbender’s gown is different and colorful and I also kind of like Sidney Poitier’s daughter Sydney’s silver dress. Beautiful dresses. Fun to see you back to doing this, Liana. It’s a cool tradition. Jennifer Gardner’s dress is lovely. I bet with your skill at sparkles it could be really beautiful. I’m less into Liza Minelli’s outfit. I think it looks dowdy on her. Oh… did you see Lupita Nyong’o’s dress? I want that skirt so badly. Such a beautiful gown on her, though I think with her dark skin she could have gone for a more dramatic color. Aw, thank you for doing Jennifer Garner’s dress!! You made my morning. :-) (I fell asleep early, what can I say). I wish I could vote for all the dresses, you always do such a great job. I’ll be happy with whichever one wins the poll. As for my choice of a recolored dress, I will consult with my ‘assistant’ (aka daughter) and see what we come up with. Thank you so much, this was fun! Wow! It must have been a lot of work to do all those! I particularly like the red-and-white-patterned-one, the grey one, and the pink one. Can’t wait to see which one wins! In shock that Mr. McConaughey actually won! I will have to think about what dress to recolor. As for my vote in this poll, it was a toss-up between several of the outfits (Ellen Degeneres’s tuxedo turned out great!) but Bette Middler’s dress looks soooo good in 2D! Just let me know! And you can keep it in your pocket a while, too, since there’s not a ton of dresses to recolor yet. All the dresses turned out so nicely it was fun to see all the different colors patterns textures and styles. You used some really cool techniques your alys so creative tithe your dress drawings and they look super good. 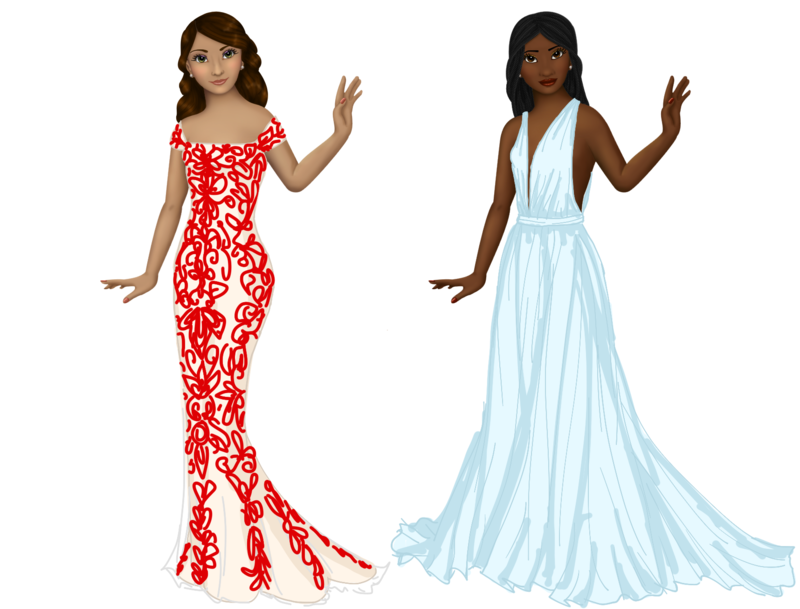 i cant wait to see which ones you will make into dresses for your paper dolls i think would all make a good additon to the paper doll wardrobe! Hi Liana, I hope you will see this reply; I wasn’t sure how you preferred to be contacted about the dress to be colored. I have consulted with my ‘assistant’ a.k.a. 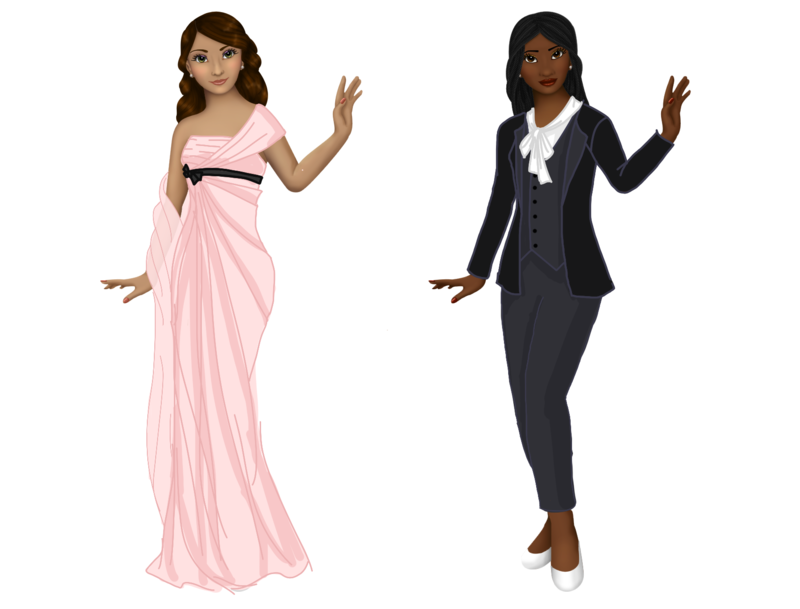 daughter, and she would like to have you color the Valentine’s Day Regency Gown. For five years old, she’s pretty specific, so please feel free to alter as you see fit. :-) And thanks for understanding. She (and I, I guess) would love to see turquoise gloves and bottom ruffle, a pink shawl, lavender dress (the body of the dress), red roses, and pink draping over the bottom ruffle, kind of like it is now. Maybe it could be a different shade of pink? Well, I’m sure this will be a very vibrant dress, so again, feel free to make changes so it doesn’t look clownish. And thank you for this blog, my daughter just loves it! And so do I! I can make that work! I will try to have it up before the end of the month.